Bright, spacious interiors that are also quiet, comfortable in temperature and efficient to heat. These are properties that often differentiate modern buildings from their historic counterparts, and this is largely thanks to advances in glazing technology. A good example of this came recently with the opening of the David Attenborough building in Cambridge. The building is owned by the University of Cambridge and houses the Cambridge Conservation Initiative and the Museum and Department of Zoology. Originally completed in 1971 in the brutalist style popular at the time, the building has been celebrated by architects as an outstanding example of the period. However, it was also one of the poorest energy performers in the university’s estate thanks to single-glazing and a lack of insulation. When refurbishing the building, the main goals of the architects were to improve the accessibility, openness and energy performance of the space. Glazing played a key role in achieving these aims. To help light flood deep into the main body of the existing building, a new atrium has been created in the centre, descending through four floors. The roof of the space is fully glazed using double-glazed units comprising two panes of heat-strengthened Pilkington Optilam™ clear laminated glass. The atrium contains a stairwell surrounding a fully glazed lift shaft, allowing light to pass down through the space. This helps illuminate one of the building’s most striking new features – a three-storey-high interior living wall. The location of the glass in a key entry and exit route meant that it needed to meet strict regulations for fire protection. To address this, Pilkington Pyrostop® was used, a product which has been tested to maintain integrity for 60 minutes and provide 30 minutes’ insulation rating in the event of a fire. This protects occupants from spread of flame, smoke and gas, while also providing heat protection to allow time to safely evacuate the building. The way occupants and visitors enter the museum has also been completely re-designed, with a double-height glazed extension at the front of the building containing the new entrance to the museum. Previously, the entrance to the museum was largely hidden, creating a sense of inaccessibility. 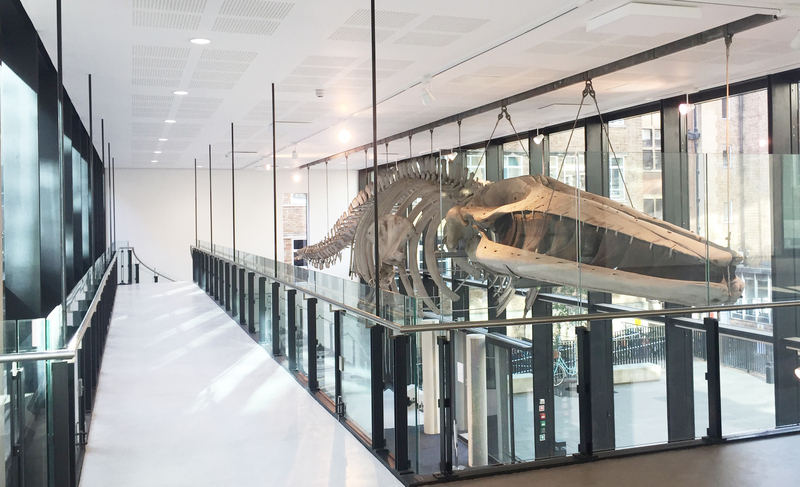 The new extension space which links to a new café also houses some exhibits from the internationally renowned Zoology Museum, including its most striking artefact – a 21-metre-long finback whale skeleton. The outer pane of the roof light features a Pilkington Suncool™ 66/33 coating, which reduces the amount of solar energy entering the building while maintaining a high level of clarity for visible light. The same coating was used on the glass surrounding both the existing building and the extension. These units, constructed using a system provided by Schüco, featured an outer pane of 6mm glass and an inner pane of 10mm Pilkington Optifloat™ Clear glass, sandwiching a 20mm cavity. This relatively large cavity both helps to deliver excellent thermal insulation and improve the acoustic performance of the glass. Michael Metcalfe, commercial sales manager at Pilkington United Kingdom Limited, said: “The architects on this project have done a very clever job of opening up what previously felt like a rather intimidating building and making it much more inviting for visitors. At the same time, they have also brought the facility up to date in terms of its energy performance. “Our glazing has played a big part in making both of these things possible, and really the project is a showcase of the many benefits Pilkington glass can bring to buildings in terms of aesthetics, efficiency, structural strength, fire safety and acoustic performance.